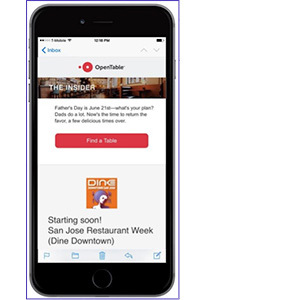 OpenTable has an aggressive email marketing calendar with over a dozen opt-in campaign types, supporting the desire of customers to find excellent restaurants in their area. Restaurants benefit from the high level of exposure and seat bookings generated from the email campaigns. Managing this many highly complex responsive email marketing campaigns was very time consuming. So OpenTable asked Beasley Direct, to re-construct their campaigns into templates that are more automated, and easier for marketers to execute regardless of programming experience. The templates are responsive (they look great on desktop and mobile), and rather than having to do extensive data pulls for each section of an email, content is now delivered into each email section from data extensions. The result is easily-editable emails that deliver highly personalized offers to customers—all which takes a fraction of the marketing department’s time to create each week. Their responsive email marketing response rates are on the rise with more personalized and engaging content being delivered to the customer.